Fragrance, Cosmetics, Fashion Accessories Enjoy 4% instant discount in a single transaction and iRich App members get points bonus for every purchase at Ever Rich. Purchase over NT$6,900 & get NT$300 off, iRich App members get 300 points bonus. Purchase over NT$13,800 & get NT$600 off, iRich App members get 600 points bonus. Purchase over NT$20,700 & get NT$900 off, iRich App members get 900 points bonus. And so on. Download iRich App and complete the registration to earn 350 points reward. 2. Per eligible invoice may use one instant discount. One discount per invoice only. 3. Participating fashion accessories brands include Swarovski, Folli Follie, Agatha, Alexandre de Paris, Thomas Sabo、Grosse, Queen Jocelyn, Toscow, and Apm. 5. The bonus iRich points will be credited to your accounts by June 28, 2019. These points are valid until Dec. 31, 2021. Bonus points for this event are not transferable and cannot be exchanged or sold. 6. Ever Rich reserves the right to modify and terminate these Terms and Conditions. Please refer to the onsite notice for more information. Int'l Boutique, Jewelry, Sunglasses, Watch Enjoy 8% instant discount in a single transaction and iRich App members get points bonus for every purchase at Ever Rich. Purchase over NT$20,000 & get NT$800 off, iRich App members get 800 points bonus. Purchase over NT$40,000 & get NT$2,000 off, iRich App members get 2,000 points bonus. Purchase over NT$80,000 & get NT$5,000 off, iRich App members get 5,000 points bonus. Purchase over NT$120,000 & get NT$9,600 off, iRich App members get 9,600 points bonus. And so on. Some products are not applicable to this promotion/event. 2. Per transaction must contain one non-on-sale product to this instant discount promotion/event. 3. Per eligible invoice may use one instant discount. One discount per invoice only. to 9,600 points with purchase of NT$120,000 and above. (One points bonus per invoice only. 6. Ever Rich reserves the right to modify and terminate these Terms and Conditions. Please refer to the onsite notice for more information. 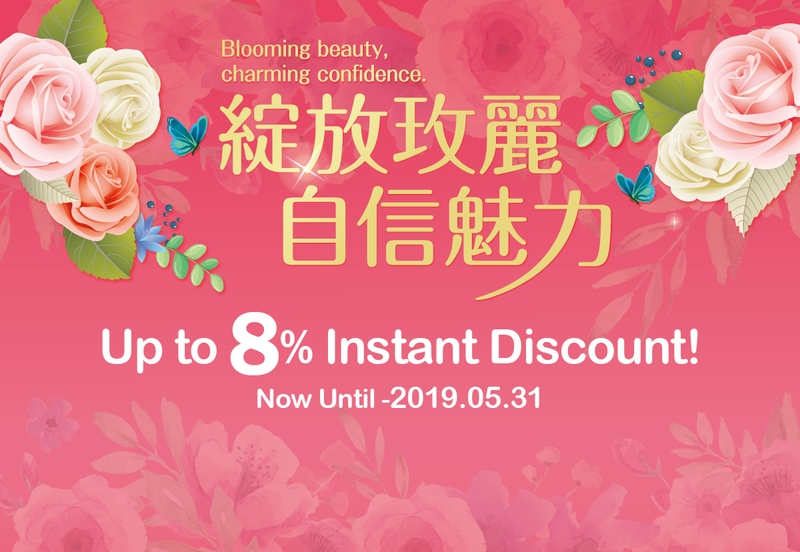 04.10-05.31, Get a FREE Gift when you spend over NT300,000 (after discount) in total on the day at Watch / Jewelry Products. Purchase over NT$300,000 & get a Double Automatic Watch Winder. 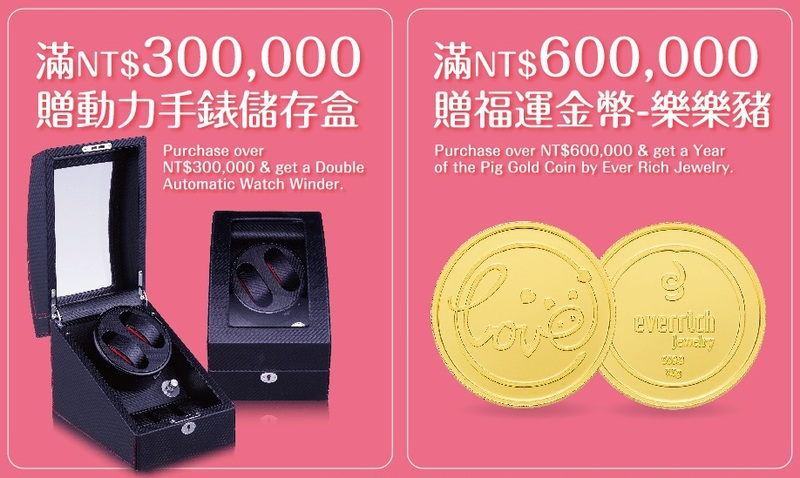 Purchase over NT$600,000 & get a Year of the Pig Gold Coin by Ever Rich Jewelry. 1. Per invoice of the eligible amount may redeem one gift on the day of the purchase. One gift per invoice only. 2. Gold products are not applicable to this event. 3. Please refer to the onsite inventory for the gifts. Limited quantities only. While stock lasts. 4. The gift must be returned upon making a refund of the purchase(s). 5. Ever Rich reserves the right to modify and terminate these Terms and Conditions. Please refer to the onsite notice for more information.